What is a Bubble Sort. Bubble sort is usually the first sorting algorithm taught because it is a simple sorting algorithm that repeatedly steps through the list to be sorted, compares each pair of adjacent items and swaps them if they are in the wrong order. Runtime Complexity (Big-O notation) For array with the size of N items, The algo requires N steps to complete first Pass but it requires N-1 steps for Pass 2. 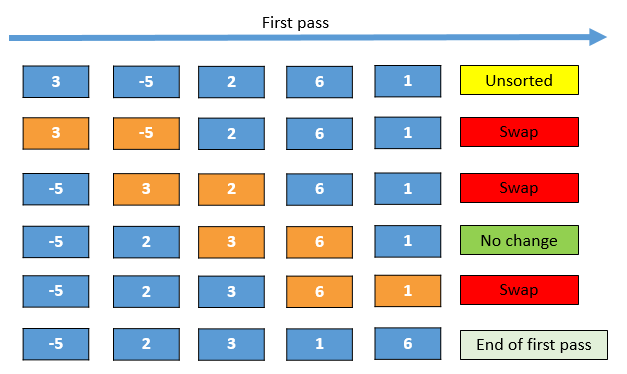 Similarly, It will take N-2 steps for Pass 3 and so on for subsequent passes.